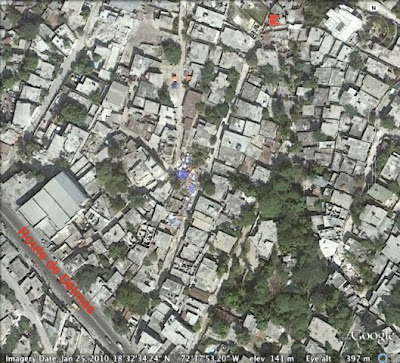 Just for fun, I decided to look up the address of Andre's family in Delmas, Port-au-Prince, never expecting to find it. 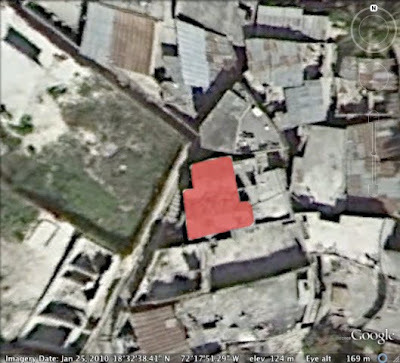 How surprised I was not only to find their neighborhood and their house, but to realize that these satellite images were taken on Jan. 25, 2010, nearly two weeks after the earthquake. I painted the roof of their house in red in Photoshop so you can find it easier on the map. It's pretty distinct anyway because of the way it's positioned on the lot, at an angle to the stairway that separates it from a walled-in empty lot. It's hard to see the destruction from these photographs, but it does give us some idea. At least we can tell that the roof of Andre's family's house is intact. We heard that three houses on their street collapsed completely, killing people inside. I was also surprised to find their campsite. 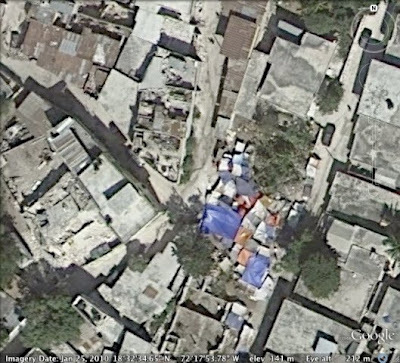 The colorful tents really stand out from the concrete buildings and rubble around them. Tony Hoffman, who is working for children's rights for the American Refugee Committee in the Delmas area, estimated that about 70 families live in this campsite. Seventeen people are living in the big blue tent with Andre's family, probably extended family members. Andre's family inherited this tent from his sister's in-laws when they went back to Jeremie where they're originally from. It was brought to Haiti by the Chinese. Andre's brother-in-law had connections with someone at the airport in order to get it. In the third picture, again I painted the rooftop in red. You can see the tents in the middle of the picture. And I wrote the name "Route de Delmas" on the main street in the bottom of the picture. This road runs from downtown through Delmas and up to Petion Ville. Now I have a clearer idea of how far away from the house they are camping. This makes security of their possessions a bit tricky. We hear that the men stay awake at night to guard everything. Tony said they are safe sleeping in this campsite because all the buildings around them have already fallen. This last picture is a big overview of Port-au-Prince and the mountain villages above it. 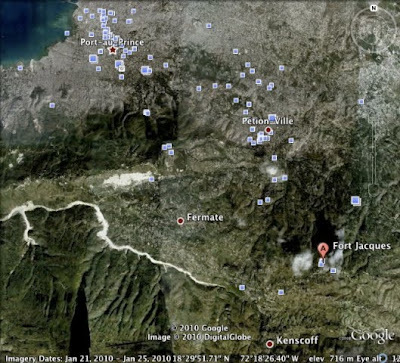 Andre's family lives about halfway between Port-au-Prince and Petion Ville. The Route de Kenscoff winds from Petion Ville through Fermath and onto Kenscoff, whose cool weather is enjoyed by the wealthy residents of Port-au-Prince on weekends and vacations. To arrive at the village where Andre's family wants to buy land you turn off at Fermath. From there, you need a 4-wheel drive vehicle, motorcycle, or strong legs to make the four mile hike over a rough, rocky road past Fort Jacques. Duval, the village where Andre grew up with his grandparents if farther off this map, beyond Athis.